Abstract: Atom interferometry as become one of the most powerful technologies for precision measurements. To develop simple, precise, and versatile atom interferometers for inertial sensing, we demonstrate an atom interferometer measuring acceleration, rotation, and inclination by pointing Raman beams toward individual faces of a pyramidal mirror. Only a single-diode laser is used for all functions, including atom trapping, interferometry, and detection. ... This work paves the way toward deployable multiaxis atom interferometers for geodesy, geology, or intertial navigation. 3. Molecular Biophysics and Integrated Bioimaging, Lawrence Berkeley National Laboratory, Berkeley, California 94720. The Magneto-Optical Traps (MOTs) described in the following two articles are cooled by three DBR lasers tuned to a Rb transition. Abstract. After successfully miniaturizing both clocks and magnetometers based on the properties of individual atoms, NIST physicists have now turned to precision gyroscopes, which measure rotation. -- Photonics OnLine News, August 23, 2016. Abstract. We present a compact atom interferometer based on 87Rb atoms that can simultaneously measure rotations and accelerations with a single expanding ball of atoms in a 300 cm3 vacuum package. Abstract. We operate an atomic fountain clock KRISS-F1 using a laser system based on a DBR (Distributed Bragg Reflector) laser. We have found that there is no major difference in the fountain performance between laser systems with an ECDL (Extended-Cavity Diode Laser) and the DBR laser, even though spectral properties of the DBR is worse than that of ECDL. 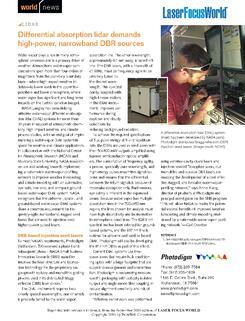 Moreover, quantum projection-noise limited stability is observed using DBR lasers. After replacing the ECDL to the DBR laser, laser system of the fountain clock became robust against acoustic and vibration noise mainly from mechanical shutters. Therefore, currently KRISS-F1 can be operated without failure of laser locking. * S. Lee, M.-S Heo, T.Y. Kwon, H.G. Hong, S.-B Lee, and S.E. Park are supported by the Korea Research Institute of Standards and Science. Photodigm DBR laser value proposition: "The DIAL technique requires a pulsed laser with high spectral fidelity and frequency agility, capable of operating at two separate wavelengths" (Spuler et al., 2015). Water vapor plays a role in many atmospheric processes and is a primary driver of weather. Atmospheric water-vapor concentrations span more than four orders of magnitude from the planetary boundary layer—where high-impact weather initiates—to lower levels in the upper troposphere and lower stratosphere, where water vapor has significant and long-term impacts on the Earth’s radiation budget. NASA Langley has been fielding airborne water-vapor differential-absorption lidar (DIAL) systems for more than 30 years in support of atmospheric chemistry, high-impact weather, and climate process studies, with an end goal of implementing a water-vapor DIAL system in space for weather and climate applications. In collaboration with the National Center for Atmospheric Research (NCAR) and Montana State University, NASA researchers are also working towards implementing a nationwide water-vapor-profiling network to improve weather forecasting and climate modeling with an automated,eye-safe, low cost, and compact ground-based water vapor DIAL system. NASA recognizes that the airborne-, space-,and groundbased water-vapor DIAL systems share a common requirement for frequency-agile, narrowband, rugged seed lasers that are used to injection- seed higher-power pulsed lasers. A differential absorption lidar (DIAL) system has been developed by NASA using Photodigm distributed Bragg reflection (DBR) injection-seed lasers. Background. We are evaluating the performance of an eye-safe, low-cost, diode-laser-based, water vapor differential absorption lidar. This class of instrument may be capable of providing continuous water vapor and aerosol backscatter profiles at high vertical resolution in the atmospheric boundary layer for periods of months to years.The technology potentially fills a national long term observing facility gap and could greatly benefit micro- and meso-meteorology, water cycle, carbon cycle and, more generally, biosphere-hydrosphere-atmosphere interaction research at both weather and climate variability time scales. Abstract. A laser transmitter has been developed and incorporated into a micro-pulse differential absorption lidar (DIAL) for water vapor profiling in the lower troposphere as an important step towards long-term autonomous field operation. The laser transmitter utilizes two distributed Bragg reflector (DBR) diode lasers to injection seed a pulsed tapered semiconductor optical amplifier (TSOA), and is capable of producing up to 10 mJ of pulse energy with a 1 ms pulse duration and a 10 kHz pulse repetition frequency. The on-line wavelength of the laser transmitter can operate anywhere along the water vapor absorption feature centered at 828.187 nm (in vacuum) depending on the prevailing atmospheric conditions, while the off-line wavelength operates at 828.287 nm. This laser transmitter has been incorporated into a DIAL instrument utilizing a 35.6 cm Schmidt-Cassegrain telescope and fiber coupled avalanche photodiode (APD) operating in the photon counting mode. The performance of the DIAL instrument was demonstrated over a ten-day observation period. During this observation period, data from radiosondes were used to retrieve water vapor number density profiles for comparisons with the number density profiles retrieved from the DIAL data. Abstract. A field-deployable water vapor profiling instrument that builds on the foundation of the preceding generations of diode-laser-based differential absorption lidar (DIAL) laboratory prototypes was constructed and tested. Significant advances are discussed, including a unique shared telescope design that allows expansion of the outgoing beam for eye-safe operation with optomechanical and thermal stability; multistage optical filtering enabling measurement during daytime bright-cloud conditions; rapid spectral switching between the online and offline wavelengths enabling measurements during changing atmospheric conditions; and enhanced performance at lower ranges by the introduction of a new filter design and the addition of a wide field-of-view channel. Performance modeling, testing, and intercomparisons are performed and discussed. In general, the instrument has a 150 m range resolution with a 10 min temporal resolution; 1 min temporal resolution in the lowest 2 km of the atmosphere is demonstrated. The instrument is shown capable of autonomous long-term field operation – 50 days with a > 95% uptime – under a broad set of atmospheric conditions and potentially forms the basis for a ground-based network of eye-safe autonomous instruments needed for the atmospheric sciences research and forecasting communities. See the Image Gallery from the NCAR/UCAR Earth Observing Laboratory showing water vapor DIAL in the field. Physiological monitoring of oxygen delivery to the brain has great significance for improving the management of patients at risk for brain injury. Diffuse correlation spectroscopy (DCS) is a rapidly growing optical technology able to non-invasively assess the blood flow index (BFi) at the bedside. The current limitations of DCS are the contamination introduced by extracerebral tissue and the need to know the tissue’s optical properties to correctly quantify the BFi. To overcome these limitations, we have developed a new technology for time-resolved diffuse correlation spectroscopy. By operating DCS in the time domain (TD-DCS), we are able to simultaneously acquire the temporal point-spread function to quantify tissue optical properties and the autocorrelation function to quantify the BFi. More importantly, by applying time-gated strategies to the DCS autocorrelation functions, we are able to differentiate between short and long photon paths through the tissue and determine the BFi for different depths. Here, we present the novel device and we report the first experiments in tissue-like phantoms and in rodents. The TD-DCS method opens many possibilities for improved non-invasive monitoring of oxygen delivery in humans. A novel Raman spectrometer is presented in a handheld format. The spectrometer utilizes a temperature-controlled, distributed Bragg reflector diode laser, which allows the instrument to operate in a sequentially shifted excitation mode to eliminate fluorescence backgrounds, fixed pattern noise, and room lights, while keeping the Raman data in true spectral space. The cost-efficient design of the instrument allows rapid acquisition of shifted excitation data with a shift time penalty of less than 2 s. The Raman data are extracted from the shifted excitation spectra using a novel algorithm that is typically three orders of magnitude faster than conventional shifted-excitation algorithms operating in spectral space. The superiority of the instrument and algorithm in terms of background removal and signal-to-noise ratio is demonstrated by comparison to FT-Raman, standard deviation spectra, shifted excitation Raman difference spectroscopy (SERDS), and conventional multiple-shift excitation methods. The design and operation of a novel dual-laser excitation Raman instrument is described. The use of two lasers of differing wavelengths allows for a Raman spectrum covering all fundamental modes of vibration to be collected while minimizing fluorescence and allowing for spatial compression of the spectrum on an imaging detector. The use of diode lasers with integrated distributed Bragg reflector gratings facilitates the use of an integrated thermoelectric cooler to allow collection of shifted excitation spectra for both of the lasers, further enhancing the rejection of fluorescence. An example is given, which uses seven excitation wavelengths for each laser to reconstruct the Raman spectrum of a solvent in the presence of a highly fluorescent dye by using a sequentially shifted excitation Raman reconstruction algorithm. A method for removing fluorescence-induced backgrounds from Raman spectra using sequentially shifted excitation (SSE) is described. The SSE method generates Raman spectra in true spectral space and does not require the generation (and subsequent reconstruction) of derivative spectra used in shifted excitation Raman difference spectroscopy (SERDS). This feature of SSE Raman spectroscopy results in improved signal-to-noise ratios compared to traditional fluorescence rejection methods while providing instrument-limited bandwidth resolution. In this work, a temperature-tuned, distributed Bragg reflector diode laser is used to produce the multiple excitation spectra required to implement the SSE algorithm. Examples applying the SSE method to analysis of motor oils and edible oils are given. We report on a simple, compact, and robust 780 nm distributed Bragg reflector laser with subkilohertz intrinsic linewidth. An external cavity with optical path length of 3.6 m, implemented with an optical fiber, reduces the laser frequency noise by several orders of magnitude. At frequencies above 100 kHz the frequency noise spectral density is reduced by over 33 dB, resulting in an intrinsic Lorentzian linewidth of 300 Hz. The remaining lowfrequency noise is easily removed by stabilization to an external reference cavity. We further characterize the influence of feedback power and current variation on the intrinsic linewidth. The system is suitable for experiments requiring a tunable laser with narrow linewidth and low high-frequency noise, such as coherent optical communication, optical clocks, and cavity QED experiments. Jie Wang, Junmin Wang, Huifeng Liu, Baodong Yang, and Jun He: Shan Xi University, Tai Yuan, China.